So, it’s actually been a year since I started doing this comic. Well, maybe ten if you count the desktop, which I am pretty damn proud of! But I wanted to finish at least one page each month, without neglecting AHS… So much for that! The biggest problem was the whole carpal tunnel thing and some other rl issues. My wrist has actually gotten better recently, thanks to some helpful advice from my readers! Another problem: One of the reasons I am doing this comic is to experiment with coloring, and while I am getting better, I am also finding new ways to spend even more time on each page. If I ever want to finish this within my lifetime I might have to learn to dial back on the details a bit. 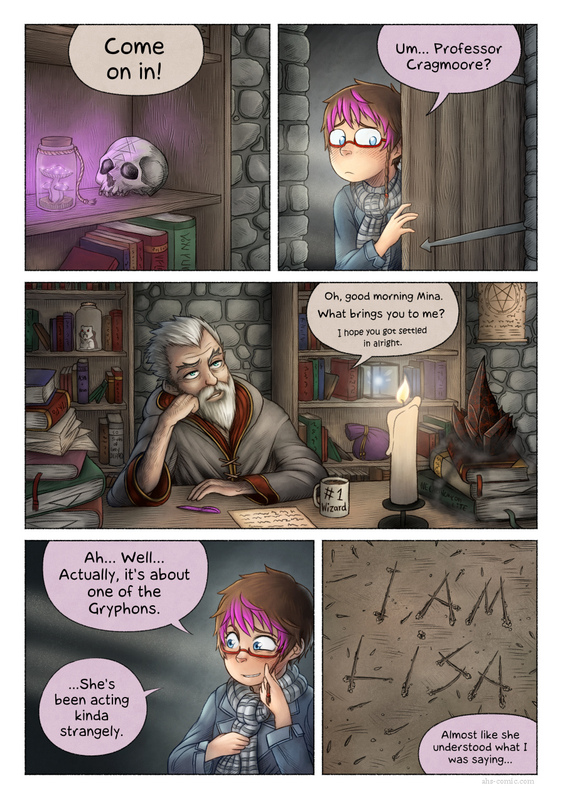 And yes… This was the page I finally had to give the main character a name and I named her Mina. Because who am I kidding? She’s basically an alternate universe version of Mina. Wow. As if one Mina wasn’t enough trouble. Hee hee. Of course, you realise that now you’ll have to do a crossover some day in which both Minas meet and the universe explodes from their combined cuteness. PS “50 Shades of Grey Death”?! The mind boggles! 50 Shades of Grey Beard actually! Ah, that kinda makes more sense. I was going to make a Charlotte’s Web joke, but just couldn’t spin it properly. Wow, the storyline can take so much differents turns from this point. It’s truly an imagination feist in my head right now. First time I’m not deadly craving for another page to instantly follow. Wait… Has he got navi? Apart from perhaps the eyes in panel 2 this has got to be one of the prettiest comic pages I’ve read in a long time. This is pretty amazing. i like IFF and AHS both, but i thought i would comment that for me at least the IFF update appears to have taken over AHS as well. It appears as the current AHS comic and the nav buttons for AHS also go to the IFF archives. Also, i just wanted to say that i love the little details on the bookcase, book titles and knick-knacks et al. Is that the evil possession rock from AHS on the stack of books? Nah, that’s Diablo3’s MacGuffin. The AHS MacGuffin is not nearly as flashy. Just saw this from the AHS page. It looks interesting. I’m looking forward to seeing how this progresses.